Are the Lack of Team Norms Sabotaging the Success of Your Team? Are there undercurrents of tension in your team? No-one in particular is breaking any rule. But there's some on-going niggling people clashes. There are behaviors and actions that prevent your team from being all that it could be? If so, one of the causes may be you haven't clearly, documented team norms. What Exactly are Team Norms? Rules state exactly what must occur, when and how. Rules are prescriptive and you shouldn't deviate from what it says to do. To bridge the gap between the closely defined 'how' to do it of rules, and the more loosely defined 'guide', of principles we use norms. Norms can sound like rules. But the difference between a rule and a norm is in how you apply the norm. In effect with norms you are saying, "This is what we normally expect to see happen, but we do understand that occasionally circumstances may cause you to perform outside the norm". "Team members will be at their machine ready for a shift handover 10 minutes before the start of their shift". Normally this is what occurs. However, one team member may well have a partner sick in hospital and for a period of several weeks the team is more than happy for this team member to come in at a different time. If you haven't articulated team norms, rest assured your team already has in place a set of informal norms. The challenge you face is, is that some of these norms may well not be the type that encourage high performance. Reduces Conflict & Stress within the Team. Team member conflict is reduced when people know what's expected. Team members arrive in organizations with their own rules, attitudes, values, beliefs and personality styles. 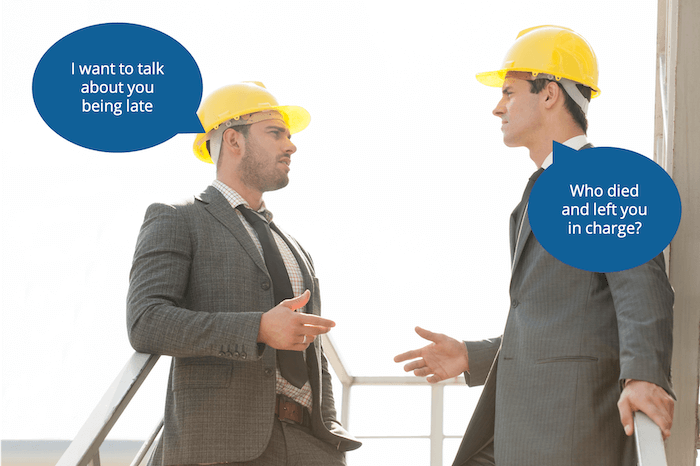 For example, for one team member (Ted) being a couple of minutes late to a meeting is no big deal; for another (John) latecomers to meetings are disrespectful. And they are the small beginnings to what can become major conflicts. Having a team norm such as "Be on Time" that is accepted by all will reduce conflict and stress between these two team members. If, Ted is being consistently late, then John can say, "Hey we have a team norm that says 'Be On Time' I've noticed the last few meetings that you haven't been - can we talk about what it is going to take, for you to get to the meetings on time?" Enables Team Members to Hold Each Other Responsible Without Having to Third Wheel the Team Leader. Sticking with our 'late to meetings' scenario: because the team norm is in place it stops Ted saying, "And who died and left you in charge!" when the issue is raised with him by John. Without the norm, John would be left with little place else to go but, "Well that's the right thing to do, according to me". With norms in place John can respond with, "This is one of the team norms that we all agreed to. If you think the norm needs changing or don't want to work within its framework, or if you think I'm misinterpreting it, then lets raise it with the team". Norms enable team members to quickly provide each other with feedback when they see performance is going off the rails, and without having to resort to the Team Leader to run interference. This is one of the hallmarks of high performance teams. Having said that, team members providing each other with feedback is often one of the most challenging (and often the last to get done well) aspects of high performance teams. To further enhance your understanding of team development you may like to read about team pillars. In particular access the "Managing Individual Performance" team pillar which illustrates the behaviors you can expect as team members progress from relying on the Team Leader to give performance feedback to each other through to doing it themselves. Enables Team Members to Focus On Their Goals and Objectives. Teams come together to achieve some type of goal or objective ... BUT how much time do you (and others) lose every day because of team conflicts? When there are niggling issues and conflicts going on, team members spend an inordinate amount of time on the niggles rather than on the business at hand - which is to achieve their strategic purpose. Teams know the behaviors which are holding them back from achieving their individual and team goals and the behaviors that are needed in order to succeed. Team norms are best developed by team members. And, because 97% of people want to feel that what they do at work is important ... you can guarantee that they will want to develop norms around those behaviors that have slipped into the team (or could slip into the team) that will hold them back from feeling successful. Applying team norms calls for good judgment. Have your over encountered a couple of misbehaving children and you had to sort out their behavior? One child you simple look at sternly and a torrent of tears ensues? Yet, their sibling requires the strongest hauling over the coals in order to get them to change their behavior. Correcting the misbehavior is the norm. How you do it, calls for your good judgment. When new team members join, as part of their induction process, have a team member take them through the norms and explain why each one is important and how to apply it for best effect. Action lists are generated and published for every meeting. Actions are completed by their due date. High Performance Teams take the time to clearly articulate and agree the norms that will enable them to function effectively, efficiently and cohesively. Diminish stress and conflict in your team by giving them the tools to sort through and minimize the number of divisive issues they are confronted with. Team Norms are just one of the tools in your tool bag to setting your team well along the path of high performance.